This page is for autographs of baseball players who are still ACTIVE. 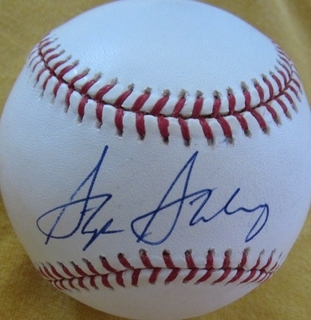 We have a wide selection of autographs from Ryan Braun, Josh Donaldson, Prince Fielder, Adrian Gonzalez, Cole Hamels, Tim Lincecum, Stephen Strasburg (autographed MLB baseball shown here), Troy Tulowitzki, David Wright and many other All-Stars and future Hall of Famers. Every autographed baseball purchased on AutographsForSale.com comes with a free hard plastic cube display holder.